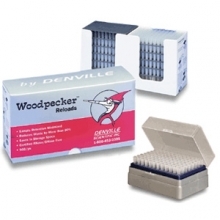 Denville's Woodpecker Reloads eliminate 75% of plastic waste, without sacrificing convenience, quality or rack stability. These tips consume only 33% of the storage space that is required by standard racked tips. Preloaded, 96 place tip carriers require seconds to remove or install in Denville's existing racks. Our Woodpecker Reloads have a unique lock down design that is compatible with our Denville racks. No more of the frustrations of flipping your tips out of the rack. Denville's new hydrophobic surface technology will dramatically reduce the sample retention most commonly found in standard pipet tips. More precise than standard tips, especially when pipetting viscous material. These universal, clear, metal free tips are RNase and DNase free. Each pack contains 10 preloaded tip carriers (96 tips in each carrier) for 10�l, and 200�l sizes. The 1000�l size contains 3 inner sleeves, with 4 preloaded tip carriers in each sleeve (70 tips in each carrier). The 1000�l must be loaded in Denville's special 70 hole rack. Clear, simple instructions are printed on each pack.